This is very true, and I'll add another prerequisite: Alias disambiguation. Modern compilers can indeed schedule regular code (such as you posit above) very efficiently for an in-order core, but only if they can hoist loads above stores to "create" ILP in the load shadows. Properly using restrict (or __restrict__ for pre-C9x gcc) can make a huge difference, often a factor of 5 or more if the cache-blocking is done right to begin with (if the access pattern isn't cache-friendly then aliases are the least of your problems). 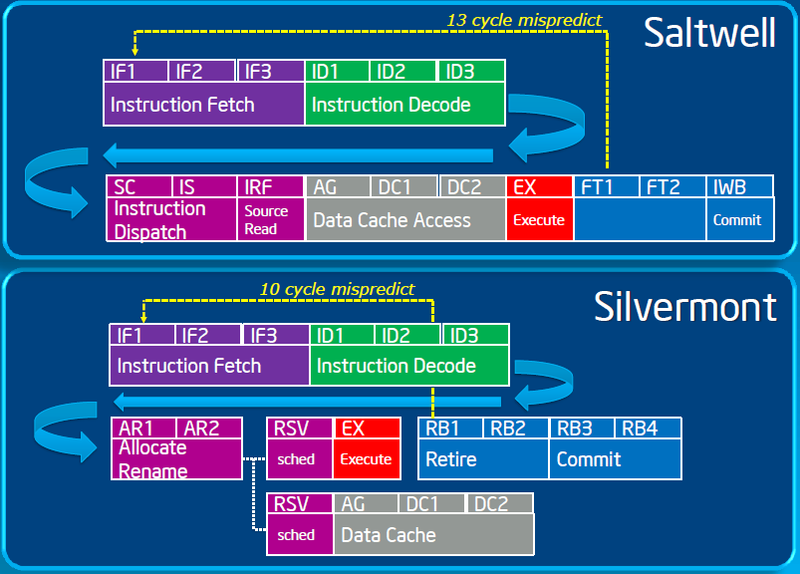 Silvermont's load/store pipeline is OoO even though the FP is not, so that helps in the case where the store addresses can be computed far enough ahead of time. Even so I suspect that FP-intensive code will require compile-time load hoisting for peak performance. > generally better off with the effort spent on integer and memory units. areas of imaging) but none that I'd describe as "common" for desktop/mobile use. > engines that need some register space. > the GPU entirely and skip the vector unit). This depends on the level of vector parallelism in the workload. For something like AVX you need tens of operations that can be performed in parallel to efficiently utilize the CPU. For a GPU you need tens of thousands.